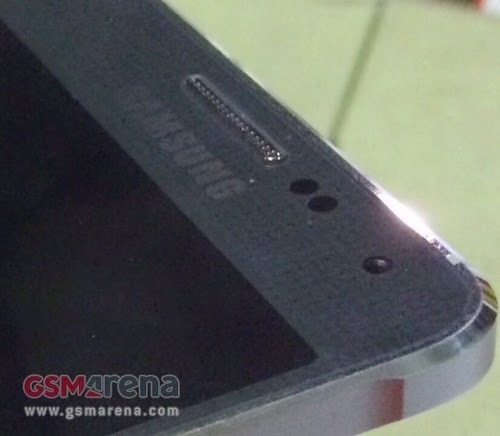 GSMArena published Friday a "live picture" revealing a metal frame on edges of the Galaxy F, believed to be a higher-end or "premium" version of the South Korean company's flagship smartphone, the Galaxy S5. The report mentioned "metal chassis, a QHD display and Snapdragon 805 chipset with 3GB of RAM," same to what has been previously reported that the device will sport a 5.3-inch quad HD display, 3GB of RAM, a 16-megapixel rear camera, a 2-megapixel front-facing camera, a next-generation quad-core Snapdragon processor, microSDXC support, and an Android KitKat operating system. Citing an "insider source," the website reported that the Galaxy F is "very similar [to] the Galaxy S5, with a removable plastic back but with aluminum frame identical with the latest iPhones." Other tech blogs described the upcoming Samsung Galaxy F smartphone as an iPhone 5S "ripoff" if the leaked image turn out to be true, but GSMArena clarified there's no way to verify its authenticity.